It’s hard for me to believe, but there are now adult baseball fans with no real memory of the time when each league contained just two divisions. They remember neither the world before the existence of the Florida (soon to be “Miami”) Marlins and Colorado Rockies nor the time when only first-place teams made the playoffs. They also don’t remember back when the Phillies and the Pittsburgh Pirates were the teams that ruled the National League East, playing each other 18 times per year in that battle of supremacy. To be fair, I don’t remember much of the 1970s — the time when the Phillies and Pirates had a stranglehold on division. For 11 seasons, starting with 1970, either the Phillies or Pirates won the division every year, with the exception of 1973 when the Mets took the division with the worst record of any playoff team in baseball history (and that includes the current six-division format). Although they didn’t dominate in the 1980s, the Buccos and Fightins combined to sweep the last four seasons of the four-division era, thus cumulatively winning 15 of the Eastern Division’s 25 season crowns. The Braves move to the East with the realignment in 1994 and their stunning run of first-place finishes (as well as the period of shared ineptitude by the Phillies and Pirates for the next 10 years) quickly erased the memory of the previous collective dominance of the division by Pennsylvania’s two teams, but it doesn’t make the stretch any less impressive. The reality is that the original NL East was for all practical purposes only competitive for just the years 1981-1989. 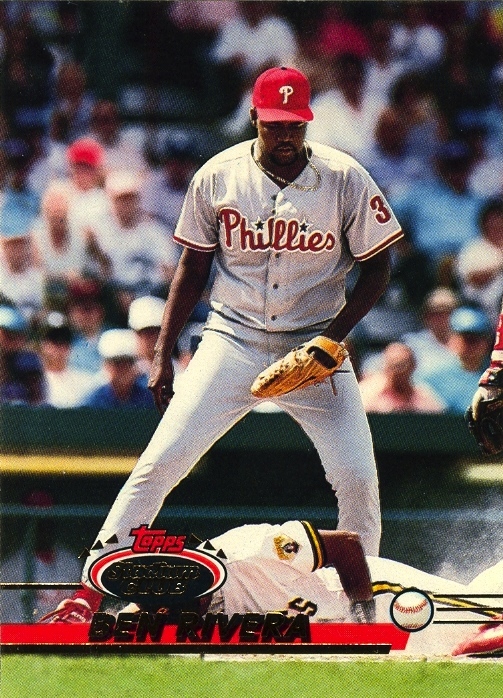 In the early ’90s, the rapid proliferation of in-game action shots on baseball cards meant that players from opposing teams started appearing on cards with frequency. 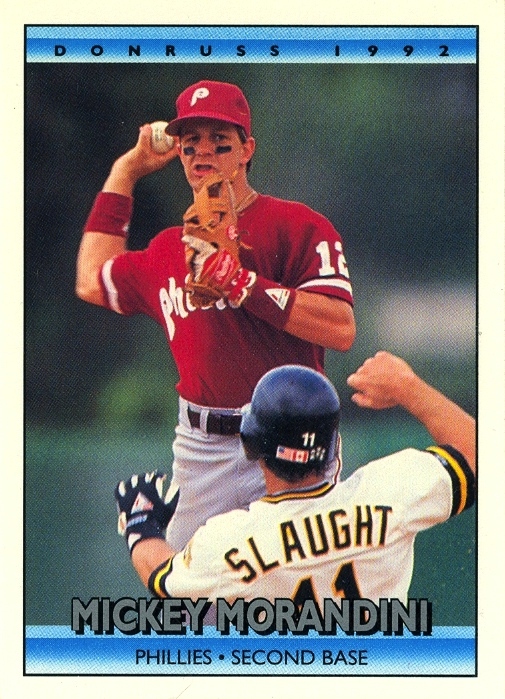 Admittedly, I have not taken the time to pour through every Phillies card from the 1990-1994 period (I have 2,518 in my collection) and create a complete tally on the matter, but the impression I got at the time was that the Pirates (Jay Bell, in particular) appeared far more frequently on Phillies cards than any other team. It certainly didn’t help that the 1992 Leaf set pictured three different Phillies with a player from the Pirates also in the photo. 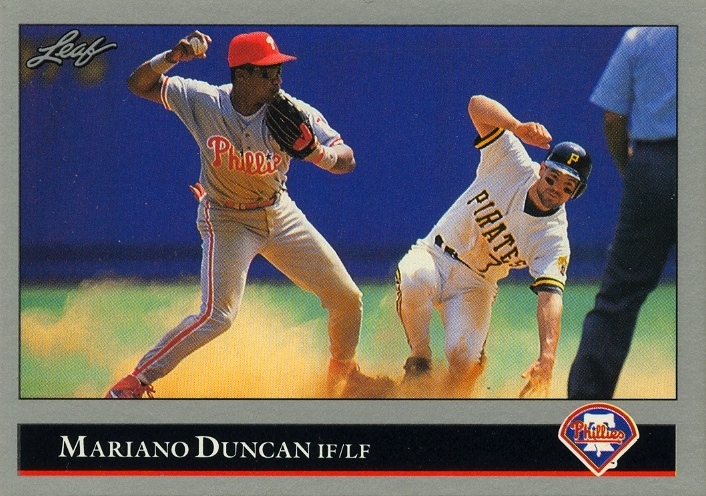 Reuse of photos (such as the 1993 Leaf and 1993 Select cards of Mariano Duncan) didn’t help matters either. I’m sure that a lot of the overlap because of those 18 games per year that they played each other (13 in 1993, with the addition of the Marlins), but there were four other teams in the division who they played just as frequently. Someday, when I have a lot more free time on my hands and fewer long-term projects in need of completion, it might be interesting to actually count the number of time players from other teams appeared in a Phillies card. Unfortunately, because my collection is made up solely of Phillies, I cannot even randomly sample cards of players from other teams to determine the inverse proportions of Phillies appearing on other teams cards. Regardless, it’s a shame that the realignment into six divisions placed the two clubs in different divisions. Although that happened 17 years ago, but it still feels wrong. While the brief rivalry with the Mets a few years ago was fun, it’s not the Phillies true rival. History has already determined that the Phillies and Pirates should be ducking it out for NL East. In fact, of the six teams originally in the division, the two teams with the best current records are the Phillies and the Pirates. Edit to Add, 11:26 AM: Apparently, I do. Read “Phillies-Pirates rivalry runs deep” on CSNPhilly.com.